(Berlin) If there were any doubts that the Amazon synod would be programmed, they should be dispelled. The Amazon synod is will not just be somehow programmed, but in the background from the German-speaking countries. The German Church is said to be recovering from the German spirit, not just since the 1960s. Like with Hegel the tourist in his rucksack, they seem to have a fixed view of the Protestantism that emerged from German lands as a role model. The demand is already old, but now it should really lunge for the neck of celibacy. The Amazon Synod is being prepared on behalf of Pope Francis by the emeritus Austrian missionary Bishop Erwin Kräutler and German-born Brazilian Cardinal Claudio Hummes. Hummes (born 1934) is a personal friend of Pope Francis. Kräutler (born 1939) is the bishop who "does not agree" when it comes to praying priestly vocations. Both have spoken repeatedly in favor of celibacy's demotion to a voluntary basis, which amounts to its de facto abolition, as practice in the Orthodox churches shows. In Protestantism, it never came up again. Both already spoke out for the ordination of women. The Amazon synod with the aim of a married clergy is therefore only a first stage in the attack on the sacrament of Holy Orders. Kräutler is head of Repam Brazil and Hummes is head of the entire Repam network. Repam, in turn, was founded in late 2014 through episcopal conferences in all Amazonian states to prepare the Amazon synod on behalf of the Vatican. Thus, Kräutler and Hummes have a central influence on the direction of the synod. 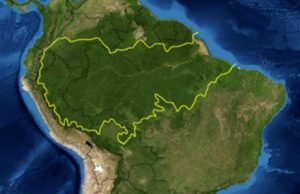 The main concern of the Synod, which has since been barely hidden, is, unlike allegedly, not a "cry" of the indigenous Amazon people, because they have no priests. 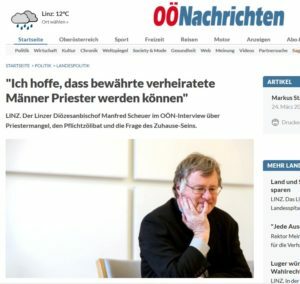 Hummes himself immediately smashed an unwanted proposal to remedy the alleged shortage of priests for the maximum of 300,000 Amazonian Indians. Why? Because the primary goal is not the pastoral care of the Indians, but the abolition of celibacy. In any case, the Amazon Indians still lack access to the understanding of the Sacraments and the Catholic priesthood. It is rather a ghost from the past that has returned here to the Church. A very old ghost, which found its "most recent" revival through the exaggerated "expectations" of the Second Vatican Council and the 1968 Movement. This explains why the main players of the Amazon Synod are already in their 80s. Kräutler belongs with his 79 years to the "boys". The German convalescence also includes the emeritus Bavarian bishop Fritz Lobinger (born 1929). The Repam-makers refer to him when they talk about a further development of the "ecclesiastical ministry." The dynamite being used to blow up celibacy has been dumped in the exotic Amazon basin. The fuse is being passing through Rome but is really in the German-speaking world. The spatial relocation was made because earlier attempts had failed in Europe, and no one wanted to get his fingers dirty, that is, to endanger his career. At least under John Paul II and Benedict XVI. it was like that for the most part. But under Pope Francis things have changed a lot. "My hope is married priests". Bishop Scheuer: "My hope ..."
"If that works, it has to be in situations where the need is different." With the question, whether the Amazon-synod to remedy the alleged lack of priests among the Amazonian Indians with so-called "viri probati", i.e. ordaining married men to the priesthood, Bode did not even say. He seems to take it for granted. Not only does the desire resonate as the father of thought, but insider knowledge. Or is Bode just in a hurry? Does he want to say B before he says A? It looks like that, but it is not. Bode only let the cat out of the bag on Monday. The alleged Amazon emergency serves only as a pretext, Katholisches.info has written about it since the end of 2015 [Actually, 2014] , to tip over with an eco-friendly diversion of jungle flair, the annoying, sometimes despised celibacy of Europe, quite specifically and especially in the German-speaking world. An open or hidden modernist clergy and episcopacy has in recent decades deprived the priesthood of its gloss more and more systematically (keyword: general priesthood, keyword: parliamentary proceedure; keyword sexual abuse; keyword: desacralization; keyword: sacramental sacrifice) and priestly vocations if not fought, then neglected. "Who does not want priestly vocations, gets none". In other words, one may assume that up to the highest ecclesiastical circles, the lack of priests is perceived only to a limited extent as a tragedy, but as a welcome, even a desirable opportunity to put an end to celibacy. In recent years and decades it has been repeatedly reported that "too pious" seminarians from the seminaries were bullied. Anyone who appeared to be too orthodox when registering was not admitted at all. This negative selection has left its mark. The considerations go even deeper. The bill seems that then suddenly there are not enough appointments (the appointment becomes a normal, collectively regulated and union-secured job), but that of the modernist clergy, threatened with extinction, who is only able to produce appointments to a small degree, again has the necessary priestly vocations to keep the orthodox and traditional young priests in check. 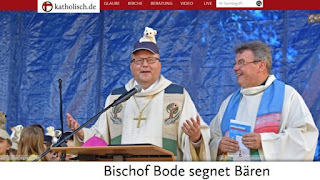 Bishop Bode presented in a Osnabrück online medium, "Marriage for All"
The theological faculties are known to produce everything but not necessarily orthodox theologians. The lay graduates of these faculties will then, instead of flowing into the full-time diocesan apparatus, take the place of future married clergy. Enthusiasm with Church lay apparatchiks does not grow with the experiences of the last decades. Indeed, in recent years, many a conservative and a traditionalist have dreamed that the question of who will direct the Church tomorrow will come about on its own, for those who become priests today will find it highly in the conservative New Rite or Old Rite orders. At least not for Kasper & Co. It fits into the picture that Bishop Bode recently spoke out in favor of the blessing of "gay couples". As early as 2010 he left the question of women's ordination open in the room. At the beginning of 2018 he hinted that there should be a women's deaconate at least soon. With zeal he "engaged" at the synods of the family for the remarried divorced. The popularity of the media in all this is certain, and the structural "advantages" in the Church are obvious - following the logic of self-confessed progressives and hidden modernists. 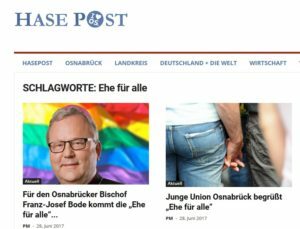 The fact that Reinhard Marx is the democratically elected President of the German Bishops' Conference and Bode is his deputy, provides insight into the state of mind of the German episcopate. Those orthodox parts of the Church who instinctively recognize such a development as wrong will slowly but surely have to rise if they do not want the steamroller to roll Francis down over them. 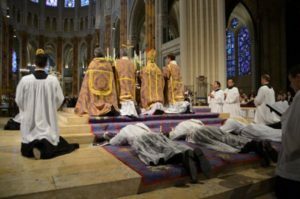 Above all, they will have to shake off the lethargic mantra of the modernists that celibacy is "only" a law of the church, but "theologically" there are no objections to a married clergy. [Emphasis is EF's] This is certainly not the case for celibacy, if it were only in place because it was a mere law, against which it was on so many occasions and so massivel attacked, it would not have lasted for two thousand years. For what if it were just human work? With the suspension of celibacy, the Church would also admit itself, that which its opponents have long asserted, that the Church had forced on the people for 2000 years an "unnatural" and inhumane system. Modernists overcome this absurd contradiction by appealing in their characteristic style to "liberation." 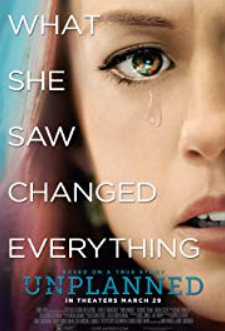 Such a grotesquely scandalous self-accusation was already alleged in connection with the admission of remarried divorced. The Church has inflicted inhumane "suffering" on people with their "compulsion" to indissoluble marriage. Today even high Church representatives talk like this about their own Church. The enemy is inside. Even the better part of the clergy turns out to be rather monosyllabic about celibacy. Any discussion about it seems annoying. Is the clergy already like the Western European Christian Democrats? Although they still lead a C in some Party names, they hardly know in substantive questions why they are actually Christian and what that means in concrete terms and demands of them. He who no longer know where he comes from, and why he stands where he stands, will at best play fire brigade on contentious issues and ultimately fail, and thus help set the wrong course for tomorrow. The mere retention of celibacy for reasons of opportunity and cost considerations would indeed be doubtful. The question is much deeper. The fact that many do not recognize this shows how long celibacy has already been left aside and there is hardly any instruction on it. Celibacy goes back to the model of Jesus Christ. A bigger model does not exist. The Lord himself spoke of celibacy "for the sake of the kingdom of heaven." He himself said that this should be for "he who can grasp it." One would think that the celibate clergy should be able to do this, but that is only partially so. And even those who can "grasp" it for themselves hardly dare to publicly defend this lifestyle prescribed by Jesus or, at least within the Church, pave the way for young vocations and not obstruct it. Pope Francis has so far made no serious effort to defend celibacy. The "clearest" statement was that celibacy was personally "no problem" for him. A confident defense looks different. Moreover, the papal dialectic makes it almost impossible to nail Francis to any word. What really applies to him does not really become tangible. The purely "personal" decision for himself does not even question the modernists. Their slogan is yes: If you really want to live celibate, you should just do it, but whoever wants to marry (or live with his gay partner or get divorced and marry a second time), he should also be able to do it. Celibacy, however, is an inseparable part of the priestly identity. It is an integral part of the ordained priesthood. The Orthodox Church knows that well, though it has not been able to keep celibacy with the secular clergy. Therefore, a candidate must already be married before being ordained a deacon or then a priest. After consecration, a marriage or remarriage, if he should become a widower, is no longer possible. Why would that be so in the Orthodox Church when it is supposedly "only" a law of the Latin Church, as can be quickly heard in discussions? Of course there is a fundamental contradiction in the practice of the Eastern Church. A Lutheran pastor put celibacy in a nutshell: "My Catholic colleague is married to his congregation. I prefer to be married with my wife." Either someone is married to the Church or to a woman. Orthodoxy knows about this, but is no longer able to overcome this aberration, forced by those who could not "grasp it." Protestantism, on the other hand, knows no bounds. Since marriage is "only a worldly thing," as Luther said. He himself had only been forced to "flee" to the monastery and become a priest and eventually married a cloistered nun. The breaking of vows and promises did not cause him any problems in some ways. Protestantism does not have a sacramental priesthood, so it does not matter what it does and says in this area: it is not good for the Church which does have them. Only the Latin Church has consistently defended and enforced celibacy for two thousand years, against both the opponents of celibacy and conversely, the marriage against the Manichaean-Cathar enemies. This is not just a religious and cultural-historical achievement, as the comparison to the other Christian communities shows, but much more. It is visible evidence that the Roman Catholic Church is the true church of Jesus Christ in the thicket of an estimated 40,000 Christian denominations worldwide. Incidentally, this also applies to the indissolubility of marriage, which was consistently maintained even by the Roman Catholic Church. Pope Francis and his Adlati, from Cardinal Kasper to Cardinal Hummes, have already laid hands on the sacrament of marriage. Now they also want to lay hands on the sacrament of Holy Orders. If that is not dismantling? Bode and Scheuer have started with their statement to prepare the public of the German-speaking countries. Your comments within the last month show how secure this part of the high prelates now feels. There are not 18 months left until the beginning of the Amazon Synod. Only idiots seek a married priesthood. Along with female ordination, this will thoroughly decimate the Catholic Church. In my opinion, worth at least two cents, this is the goal of Jorge Bergoglio and based upon the damage already done to many decent, working to be faithful in spite of intentional undermining, particularly of struggling marriages, the demise of the Catholic Church is quite well deserved and fitting considering its many decades of decadence. But, in my less violated(increasingly rare) moments, it breaks my heart. Here is my hometown diocese from which then Archbishop Burke was purged, it is already known that there will be female priests. It is not a matter of if but of when. The groundwork is already being laid in regional socialist entities with female pastoral associates who are "stealth candidates" for the priesthood. And, as an example from my own life. I had a conversation on this topic with my daughter as it related to my celibacy(my CHOICE) in the aftermath of the abandonment of our marriage by my wife. I had faced a very acute temptation and both the lady and I faced it, and walked away from each other, as a mutual choice. I called my daughter to inform her of it and to apologize for allowing temptation to get so close. After a long conversation, my daughter told me that my choice to remain faithful/celibate/unattached had made her life so much easier to bear because she was never placed in the position to have to choose loyalties between her mother(whom she loves but has no respect for) and a woman whom I would have chosen to be with. She told me that because of my mother(who raised me Catholic and profoundly influenced me and my daughter) and me, her children(my grandsons) were Catholic. She said if only her mother was in the picture, she would not be Catholic. My honoring our vows are THAT important to her. I reiterate, we are not alone. Pedro Regis of Bahia, Brazil received a message from the Most Holy Virgin that sometime in the future Priests in the Amazon would be persecuted and on the run. Lets hope and pray not yet there is a irony here regarding the Amazon. Perhaps married Clerics think twice if possible Martrydom is involved. I've been accused of being an old fogy, not hip or cool, so perhaps some younger readers may come to my aid and inform me if Bishop Bode's head gear of baseball cap with what appears to be a teddy bear stuck on is in some way cool. To my eyes it appears sad and ridiculous.